All plants need water to live, but some plants take this relationship a step further. Climate change, our world warming up, has made us think about water in a different way. Some aquatic plants have adapted to living either completely submerged in water or on the water’s surface and some in-between. There is now a diversity of aquatic plants which are both inspiring and fascinating. These plants are being looked at very differently now that we have water levels which appear to be rising. It’s taking people and gardeners on new journeys and ways of experimenting with aquatic plants. Because many aquatic plants have adapted to part shade due the murkiness of their environment, or larger plants hanging over them, they’re often very well suited for indoor growing. Plenty more people these days are setting up Jarrariums or self-contained ecosystems for growing aquatic plants indoors. They’re simple and fun to set-up and maintain and allow people to appreciate the beauty of aquatic plants in their own home. The following is a guide to setting up your own small underwater landscape in a jar using the technique made popular by Diana Walstad in her book Ecology of the Planted Aquarium. The first thing you’ll need to do is to decide on a container. The size is up to you, but keep in mind containers with wider mouths will be easier to work with. A lid will help slow evaporation. Bottles and jars with cork lids (if you can find a cork lid – try kitchen departments!) are naturally porosity as cork slows evaporation of the water while still permitting gas exchange with the atmosphere. Terrariums with lids also work well. Make sure you rinse and dry the container before using, and peel off any stickers. Now you’ll need to give the plants some potting mix to grow in. Use a potting mix with no added fertiliser in it, synthetic or otherwise. This includes little synthetic fertiliser prills, manure or blood and bone. Don’t love your Jarrariums too much – avoid additives like soil wetting agents. Any of these additives to the soil will only release excessive nutrients into the water, creating nutrient spikes that fuel the potential growth of algae. Generally, cheaper potting mixes won’t have these additions. You may also find what you’re after being sold as “potting soil” or “garden soil” at your garden retailer. Soak the mix in a bucket of water for a few hours, stirring occasionally. This will ensure even saturation and separate out any larger pieces of bark as they float to the top. Pour the water out of the bucket while keeping the bulk of the finer particles of your soil at the bottom. This is what we’ll be using to line the aquarium. You’ll also need some kind of gravel or sand to cap the soil layer, preventing it from stirring up into the water and making it murky. This is readily available at aquarium stores, garden stores, and pool & landscaping suppliers. Larger particle sizes are best as they allow freer exchange between the bacteria in the soil and the water, to prevent deoxygenated (anaerobic) pockets forming and becoming toxic. Larger sized gravel is also easier to work with than sand. It’s likely the gravel will be fairly dirty when you first buy it – before adding it to your jarrarium, it’ll need a good rinse in a bucket until the water runs clear. While you’re outside and getting a bit wet anyway, it’s a good idea to get the plants ready. Use plants that are fully aquatic to the depth of your container, are fast growing, and are able to tolerate lower light. Also, consider the eventual size of your chosen plant species. 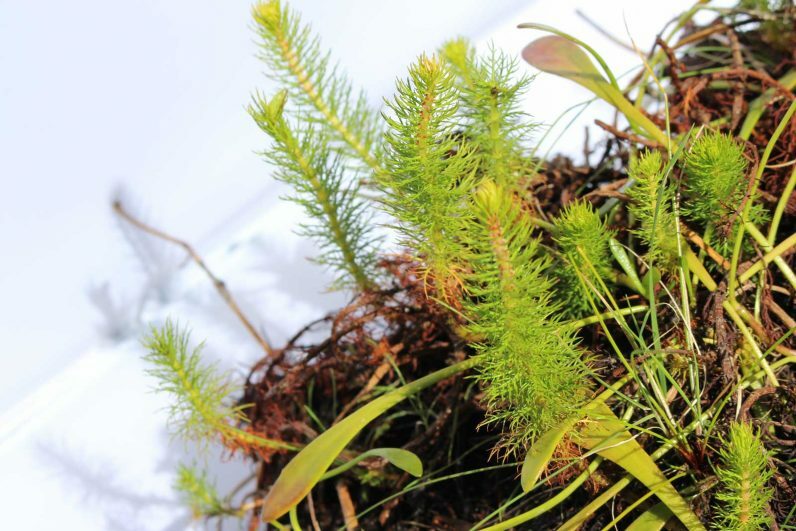 A lot of aquatic plants used in the aquarium and nursery trade are weeds once they get into the wild in Australia, so try to use native species local to your area. Some examples, Ranunculus inundatus, a plant indigenous to the area of Melbourne Other suitable plants include Villarsia reniformis & Myriophyllum crispata (pictured). Make sure the plants you use are cold water tolerant, as we’re not using a heater. 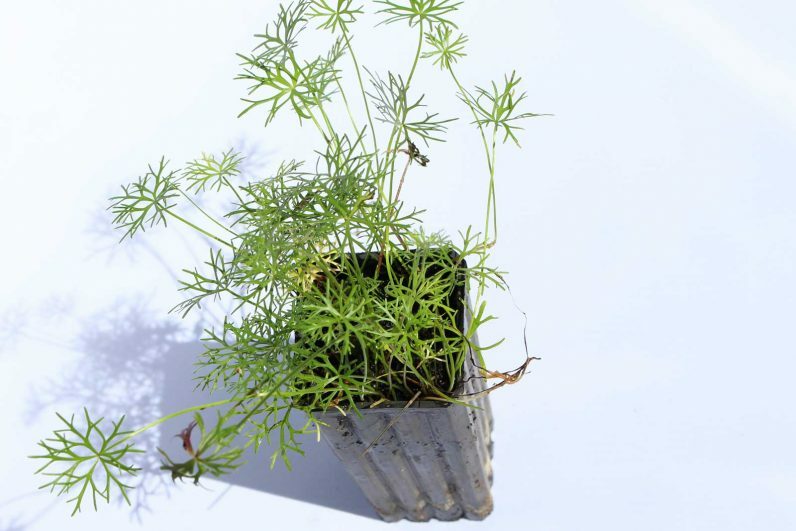 Give the plants a good soak if they’re not damp already, and gently remove from the pot by turning it upside down. Remove any dead or damaged growth. Generally, you’ll be planting into less soil depth than a pot, so you’ll probably need to prune the plant roots before planting. If you need to do this, take a clean and sharp knife or secateurs and make decisive cuts. Once you have reduced the root volume, use a hose to gently wash away any excess potting mix caught in the roots. Un-pot your plant and prepare for the chop! Your plant is now ready for the jar! Now you’re ready for the fun stuff! Take a ruler and mark 2.5cm from the base of your container. This will be your potting mix level. It’s best not to fill higher than this line to avoid compression and de-oxygenation. Take a handful of your potting mix and squeeze excess moisture out of it. It should be damp, but not soupy. Add to the bottom of your container, spreading evenly and gently pressing it down as you go. Try to avoid it sticking to the sides of your container as you drop it in (a funnel will help greatly with narrower vessels). Once you have an even 2.5cm of mix around the bottom of your container you can move onto the next step. If you have any mix stuck to the side of the aquarium above the line, try to wipe it off. Now, add your prepared plants. You’ll need a high density of plants in order to out-compete algae that may attempt to get established in your little ecosystem. Make sure that their roots are anchored into the soil. Now is a good time to add any “hardscaping” that you may like; things like interesting rocks can add depth and interest. chopsticks or long tweezers are a lot more helpful than my clumsy fingers at this stage. Next, add the gravel or sand cap. This will prevent the soil being disturbed and making the water murky. This should be about 1 cm deep, but it doesn’t need to be as uniform as the soil below. The main thing is that the soil and the roots of the plants are covered. Varying the height will add depth to your little sunken world. Again, a funnel will help. The next step is vital! It’s time for the water, but be really careful and make sure it so doesn’t disturb the layered soil structure you’ve created. The easiest way to do this by laying a small saucer at the bottom of your container and allow a tap to slowly drip onto it. The run-off will fill the aquarium while being gentle enough to keep everything together. I’ve also found that using a hose gun on the “mist” setting works well. The first time you fill your landscape the water may be a little cloudy and may have a few floating soil particles in it. This can be fixed by changing the water. I do this by flooding the aquarium with a hose until the water runs clear, again making sure I don’t disturb the soil layers. Carefully fill the jar with water without disturbing the potting mix/gravel. Install your planted jar somewhere it will get bright, indirect light. The indirect light will allow the plants to grow, while preventing algal blooms direct light can cause. Initially, your plants may shed a few leaves as they get adjusted and recover from the root pruning. Remove these leaves as they die, and any further dying leaves as the plants grow. Top up water as it evaporates, and prune the plants as you see fit. If the plants aren’t growing well, or there is an algal bloom, the position you have the jarrarium in may not be suitable. They also help fertilise the plants with their manure. Some people use freshwater shrimp for a similar reason. Also add duckweed to float on the surface of the water. 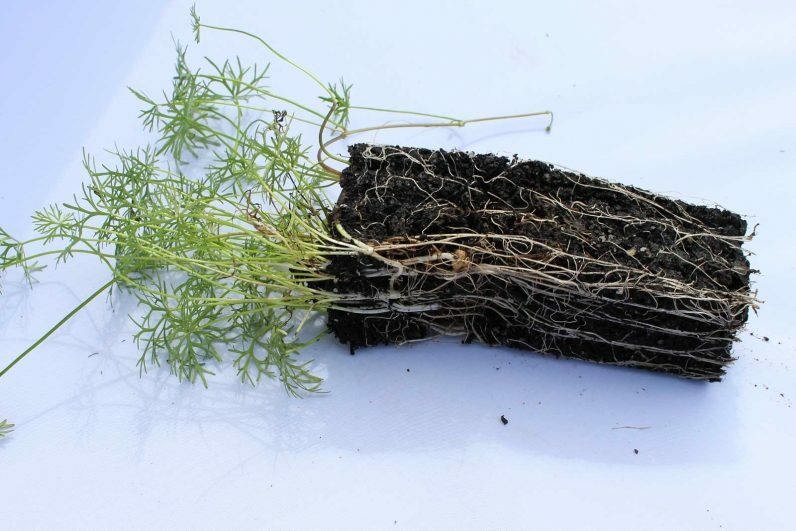 It’s long roots gently dangle down into the water like a curtain, and it’s great for removing excess nutrients. Once you have your finished product, step back and marvel at what you’ve created! Your own little underwater world, just waiting for you to get into. Over time your underwater landscape will grow and mature, eventually reaching a balance. This mimics the cycles we see in the natural world in environments like ponds and wetlands. These ecosystems perform vital functions for our environment, but the world of plants below the water surface is often forgotten. We think as time goes on we’ll all be getting a little aquatic! Next Post Roses In A Potato turns into Beautiful Buds!